By Oliver Clemens and Sabine Horlitz from An Arkhitektur, Berlin. A one dunam (1000 square meters) plot of land in the center of Ramallah costs up to $8 million; the same plot costs $300,000 in an upper-class residential area; near the settlement of Psagot, by contrast, a one-dunam plot costs only $30,000, while a dunam of land inside Zone C is available for $3,000. Through such an analysis of land value, political conditions, conflicts, social expectations and hopes all come to the fore. Land prices in the West Bank rose steeply following the Oslo Accords, as a Palestinian state seemed suddenly to be within reach. 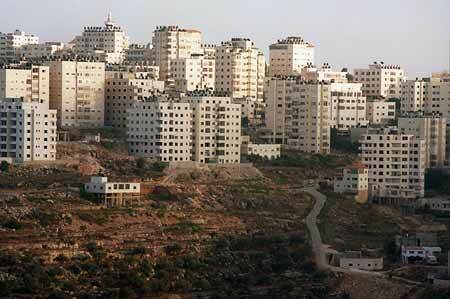 Exiled Palestinians moved back to the territories and invested in real estate. These investments gave rise to neighborhoods of American-style villas and to shopping centers, which have little in common with the image of Palestine in the European media. The existing landscape, however, is not shaped by capitalist promises alone; the occupation, the classification of the West Bank into different zones, the building of the separation wall and the struggle over the land have all let their marks upon the terrain. Safety zones surround settlement roads, and checkpoints that have been set up between villages cut through residential neighborhoods. The territorial conflict has resulted in the fragmentation of space, and spatial proximity is no longer a criterion for accessibility. The efforts exerted by the occupying power to control the space and its inhabitants; the movement constraints imposed upon them; the restrictive residency policy; and the rampant capitalist attempts to utilize the land have led to the creation of a complex and fragmented spatial structure. An analysis of land value can provide information about the operation of these forces – for it is they, rather than the condition of the plot, or its agricultural or real estate potential – that determine its value. An examination of this topic also raises the question of whether land value in the West Bank can be regarded as an objective parameter, given that it follows a distinct and rapidly changing logic. Land value depends on the zoning created in the context of the Oslo Accords, on the distance of a given plot from military zones and from Jewish settlements, and on its accessibility in relation to various checkpoints. In Ramallah, one can find exorbitantly expensive areas adjacent to waqf land that cannot be sold and to illegally rented houses in the refugee camps. In East Jerusalem, prices are skyrocketing because of Israeli residency regulations, while land in the city of Al Ram, which is now is cut off from Jerusalem by the separation wall, has become devalued. In the settlements, due to the expropriation of Palestinian land on the one hand and to state subsidies on the other, one can hardly talk about the actual value of the land.